A pulmonary embolism, is a blood clot that breaks off from the walls of a vein and travels through the circulation to the heart and eventually the lungs. The clot blocks the flow of blood to the lung tissue, which can result in serious complications and even death. In most cases of pulmonary embolism, many small blood clots shower the pulmonary circulation instead of a single, large clot. 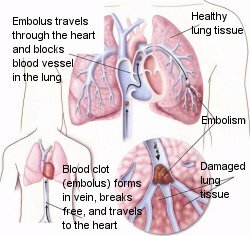 The majority of pulmonary emboli are the result of deep vein thrombosis, or DVT�the formation of blood clots in the deep veins of the legs or pelvis. The symptoms of pulmonary embolism depend on the size of the clot(s) and how much of the lung’s circulation is blocked. In very mild cases, there may be no symptoms at all; in more extensive clot formation, the patient may experience sudden symptoms such as difficulty breathing, chest pain (similar to a heart attack or angina), a blood-streaked cough, and a general feeling of uneasiness with dizziness, a fast heartbeat, and sweating. It is important to seek medical attention for a pulmonary embolism when symptoms first appear, since 10% of patients will die during the 30 to 60 minutes after onset of symptoms. If a pulmonary embolism is diagnosed quickly and the appropriate treatment with anticoagulants (blood thinners) or clot-buster drugs begins, the chance for complete recovery is good. Patients who suffer from a pulmonary embolism must continue to take anticoagulants for a period of time to avoid future embolism formation. A pulmonary embolism causes blockage of an artery in the lung, which can lead to the death of lung tissue in the area lacking blood and oxygen supply. In rare cases, the embolism that blocks lung circulation is made up of tissue, fat, or air. The majority of blood clots that reach the lungs are from the deep veins in the thigh or pelvis, making DVT a major risk factor of pulmonary emboli. Other risk factors are a family history of blood-clotting problems, immobility for long periods of time (e.g., after surgery or during an airplane or car trip), or medical conditions such as cancer, obesity, or circulatory disorders. Women who are pregnant and those taking hormone supplements or birth control pills are also at higher risk for pulmonary embolism. Individuals older than 65 are at increased risk, although this condition can occur at any age. Symptoms Vary: In almost all cases of serious pulmonary embolism, symptoms include the sudden onset of shortness of breath, along with chest pain that increases with breathing or coughing, and a cough that produces blood-tinged sputum. In less serious cases, there may be few symptoms or none at all. However, patients may complain of symptoms of DVT, including an area or tenderness, swelling, or warmth along a leg vein. The diagnosis of pulmonary embolism is made by taking a thorough history of the recent symptoms and risk factors for clotting problems, performing a physical examination, and running specific tests that look for pulmonary blood flow, such as a ventilation and perfusion scan, CT, MRI, and pulmonary angiogram. Blood tests that help diagnose pulmonary embolism include the D-dimer test that looks for a substance released in the blood when clots break free, tests for clotting disorders, and tests that measure the amount of oxygen and carbon dioxide in the blood. An ultrasound test to determine blood flow through the leg veins may also be helpful. Preventing and Treating Blood Clots: Standard treatment includes an injectable anticoagulant drug (heparin) along with an oral anticoagulant drug (warfarin). These drugs, sometimes called blood thinners, stop clots ftom getting bigger and prevent more clots from forming. Anticoagulants do not break up clots that have already formed. For most patients, heparin and warfarin are used together until the embolism is stable. Once warfarin begins to work, heparin is stopped. Duration of warfarin use depends on the patient and individual risk factors for future embolisms. Blood testing to check for the effect of warfarin on blood clotting must continue as long as the medication is used. Warfarin interacts with many other medicines and can cause serious bleeding, so it is important to be aware of all the medications a patient is taking with an anticoagulant. In cases when a blood clot in a pulmonary artery is life-threatening, thrombolytic drugs (also known as clot busters) are used to dissolve the embolism. In other cases, emergency surgery is used to remove the clot from the pulmonary artery. Prevention involves stopping blood clots from forming in the deep veins of the legs. Movement after surgery or during a period of immobilization is critical to keep the blood flowing and prevent clot formation. When on extended car or airplane trips, simple flexing exercises using the lower leg muscles can maintain blood flow. If a patient has a history of DVT or pulmonary embolism, it is critical that medications are taken exactly as prescribed and follow-up visits to rhe doctor are made for periodic blood monitoring. Compression stockings may be prescribed to maintain good circulation in the lower legs. In patients who cannot take anticoagulant drugs and continue to have blood clots, a metal filter can be surgically implanted in the main vein (vena cava) that returns blood from the lower body, through the heart, and to the lungs. This vena cava filter helps trap blood clots from the legs and pelvis and stops them from reaching the lungs.